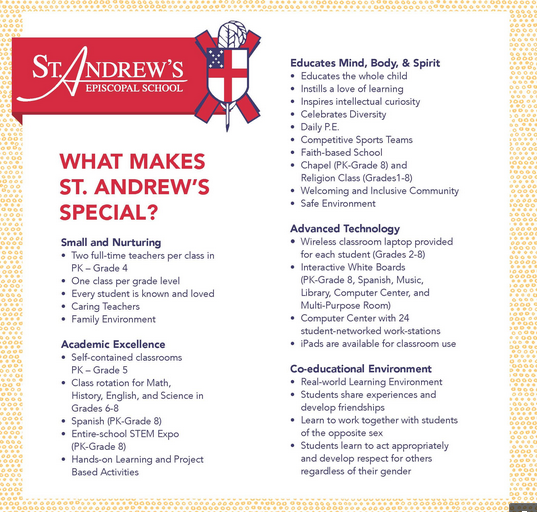 St. Andrew’s Episcopal School is a faith-based school that values diversity and inclusiveness. At St. Andrew’s we try to create a community climate that reflects our core religious beliefs. We believe that we are created in the image of God who is loving, caring, generous, patient, and forgiving. We feel that we are most at home with ourselves when our thoughts, words and actions reflect our God-given nature. We believe that God is the author of diversity so we see our differences as gifts designed to enhance and enrich our lives. As a result we believe that we are called to radical hospitality and inclusiveness. This notion of inclusiveness is a hallmark of Episcopal education. We believe it is vital to be models of love and grace by respecting the dignity of every human being, serving God in all persons and striving for justice and peace among all people. We worship, honor and celebrate God as the center of life, and we provide a comprehensive and age appropriate approach to the academic study of religion. Worship is rooted in the Anglican tradition and structure. Chapel services make use of the richness of Episcopal liturgy and the Book of Common Prayer. All students participate in worship services twice a week, one of which is a Celebration of Holy Eucharist for students in Grades 3–8. Students in Grades 1–8 attend religion classes once a week. We believe that as we become more and more aware of God’s love for us, we experience a feeling of fullness to overflowing and a desire to love and bless others. We see community service as an integral part of a life of faith. St Andrew’s students organize and participate in service activities such as food and clothing drives, fundraising for the needy in our city and the needy in other parts of the world, and sharing special occasions with area retirement home residents.